What's New in this YG PT-04 TM flash trigger ? - More stable, No misfiring problem. - Both transmitter and receiver are tested and confirmed to work with the largest number of flashes on the market. - Receiver uses 2 untis of AAA batteries, longer working hour, easier to buy. - The transmitter should be attached on the hot shoe of the camera. 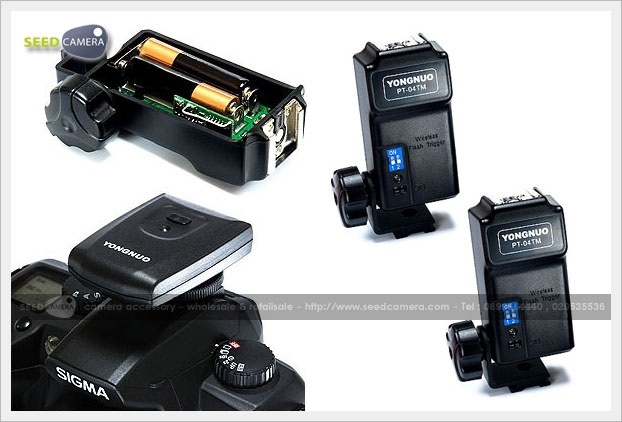 - The receiver should be attached to an external flash. - Multiple receivers can be triggered by single transmitter. - You can place the flashes at different angles and distances, with no cable attached. - The receivers can be mounted on a tripod. The angle can be adjusted as well. - Provide great flexibility for your lighting setup. - Strong anti-interference function to prevent misfiring. - 4 channels available to prevent from jamming signals. -Especially useful when there are other photographers working nearby. - The transmitter automatically sleep when standby, thus lowering power consumption. - The receiver can be switched off when not used. - Low triggering voltage, Safe for Cameras. - With its small size, you can bring it for outdoor use with hot shoe flash for creative lighting. ลิขสิทธิ์ © 2019 SeedCamera.Com. สงวนไว้ซึ่งสิทธิทั้งหมด.